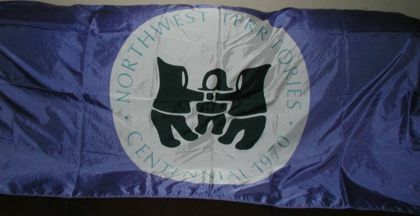 Northwest Territories Centennial Flag(s). These flags were issued during the centennial in 1970. The picture referenced on the photo archives of the NWT show two colors - blue and red. According to Fraser (1998) there were several background colors used. The logotype is on a white roundel and features three Inuk dancers. In the above photo, the flag is actually purple, not the blue it looks like.